Almighty and eternal God, who through the regenerating power of Baptism have been pleased to confer on us heavenly life, grant, we pray, that those you render capable of immortality by justifying them may by your guidance attain the fullness of glory. Through our Lord Jesus Christ, your Son, who lives and reigns with you in the unity of the Holy Spirit, one God, for ever and ever. Historically today is the feast of Bl. 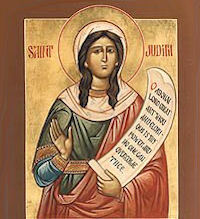 Jutta (Judith) of Russia. She was a Thuringian of a noble family whose husband lost his life crusading in the Holy Land, and who, after providing for her children, became a recluse. She is venerated as the patroness of Russia. According to the 1962 Missal of St. John XXIII the Extraordinary Form of the Roman Rite, today is the feast of St. Pius V. His feast in the Ordinary Form of the Roman Rite is celebrated on April 30. Jutta was of the noble family of Sangerhausen in Saxony. She married young, and her husband died on a pilgrimage to Palestine. 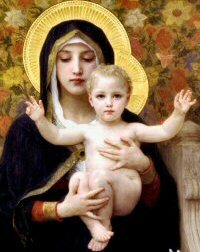 She had several children, all of whom embraced a religious life, in various Orders. After the death of her husband, Jutta devoted herself for a time to the care of the sick, especially lepers, and was favored with visions. At that time Poland was over run by Tartars, Rutheni, and Lithuanians. They burnt Cracow, Sendomiria, and other cities, and twice within ten months choked up the river Vistula with Christian corpses. Prussia was devastated next. The Crucifers with difficulty saved their lives and liberties by taking refuge in the fortresses they held against the barbarians; while the natives who had but recently been baptized relapsed into paganism, joined the invaders, and massacred the priests and other Christians who dwelt among them. The aid the Christians sent for from Germany was long in coming. It pleased God that Prussia and the adjacent province of Masovia should at this time receive a special protector and patron from Germany, in the person of St. Jutta. She came to Prussia in 1260, to lead a solitary and austere life in its thick and dark forests, while Boleslaw the Chaste and St. Cunegund were reigning in Poland. She chose for her dwelling a ruined building, not far from Culm, near a great pond or marsh called Bielczna. The neighbors observed that she was sometimes lifted up from the earth and suspended in the air while she prayed, and that when she went to the new church at Culm, she sometimes went through the wood a long way round, by the edge of the lake, and sometimes she walked straight across the water by a path which could still be seen after her death. She lived in great sanctity in the forest for four years, and died in 1264. Her friend and confessor, Henry, bishop of Culuza, wanted to bury her quietly according to her own inclination, but he could not prevent an immense concourse of people assembling from the surrounding country, so that such a multitude had never been seen in Culuza before. Thirteen priests were present at the funeral, a great number at that time, when none but missionaries had settled there, and most of those had been massacred by the barbarians. She was buried in the Church of the Holy Trinity. Fifteen years afterwards, steps were taken for her canonization, in consequence of her great renown for sanctity and the numerous miracles wrought at her tomb.